The phrase conjures visions of an icy drink, so cold the glass sweats as you take a sip and set it on the table beside you and gently push against the porch floor to set the swing in motion. Sweet Tea. Summertime. Vacation. Southern homes. Fabric. 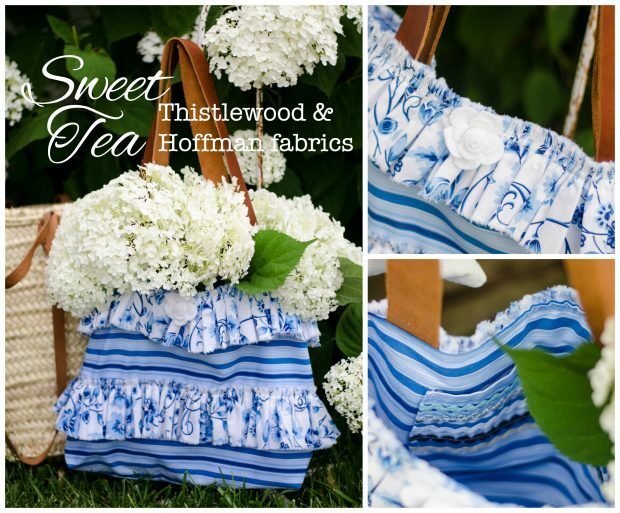 My friend KariAnne of Thistlewood Farms has a new line of fabric called Sweet Tea. Produced by Hoffman Fabrics, these lovely cotton stripes and prints are among the finest fabrics available this season. 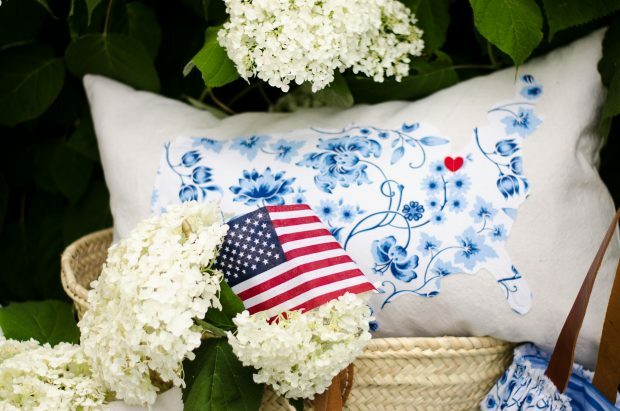 But then, that’s really no surprise considering the source from which these fabrics originate! Come along and I will share with you, not only my creations using these lovely fabrics, but also the tale of my long-standing love of Hoffman prints. First of all, I couldn’t help myself, I had to make a couple state of Ohio pillows, ’cause after all, that IS what I do! 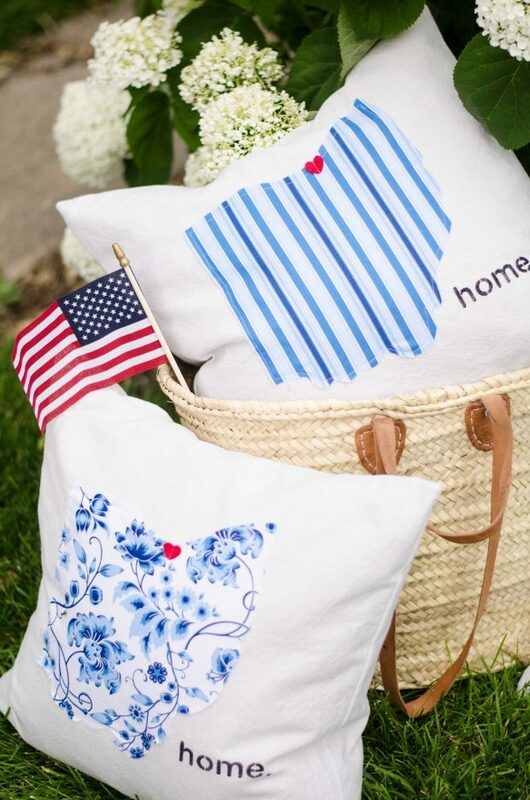 These state pillows with the small ‘home’ are an original design from back in the beginning when my business was just taking off. 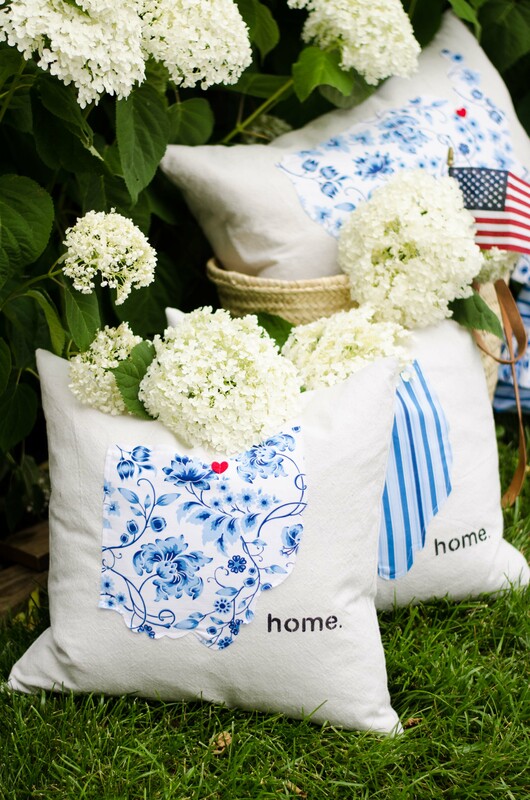 It’s still popular and one of Sew a Fine Seam’s best sellers. Can be created in any of the 50 states. I’ve also made a few with countries instead of states when asked! I love how the red heart added to a location on these states adds a patriotic touch with the white and blue. KariAnne included some fun little extras along with the fabric. 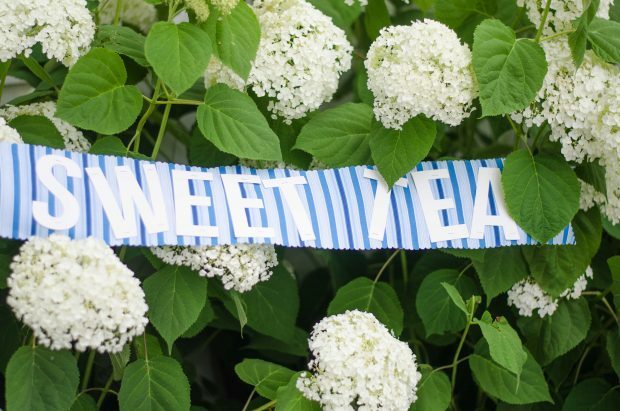 What better way to use these fun letters but to spell SWEET TEA on a banner?! Fun little bolts of rick-rack were also included – I used them too – can you spy where they ended up?! In addition to the pillows, I created a ruffled handbag. 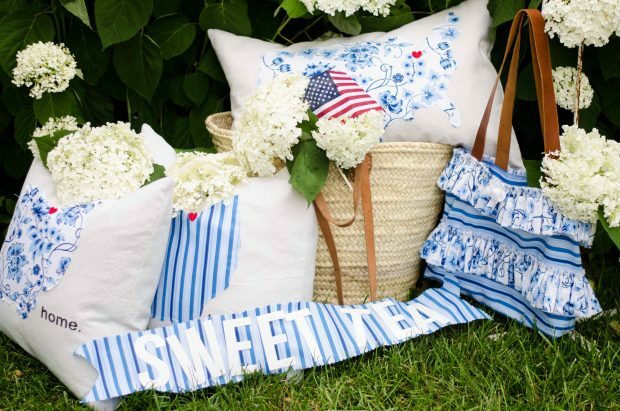 Blue and white stripes, floral, and ruffles. 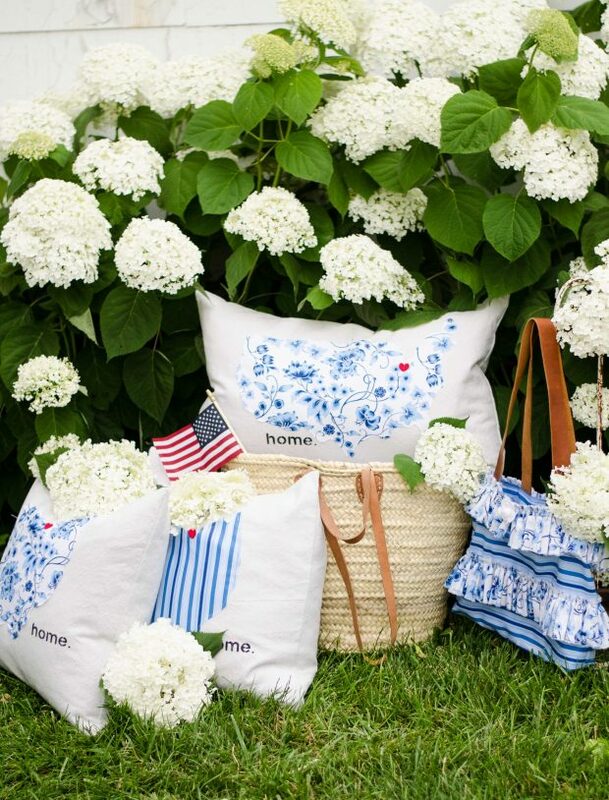 Summery, light, and fun. The handles are genuine leather and I’m loving the industrial-ness of the leather paired with the flirty, feminine ruffles and print. 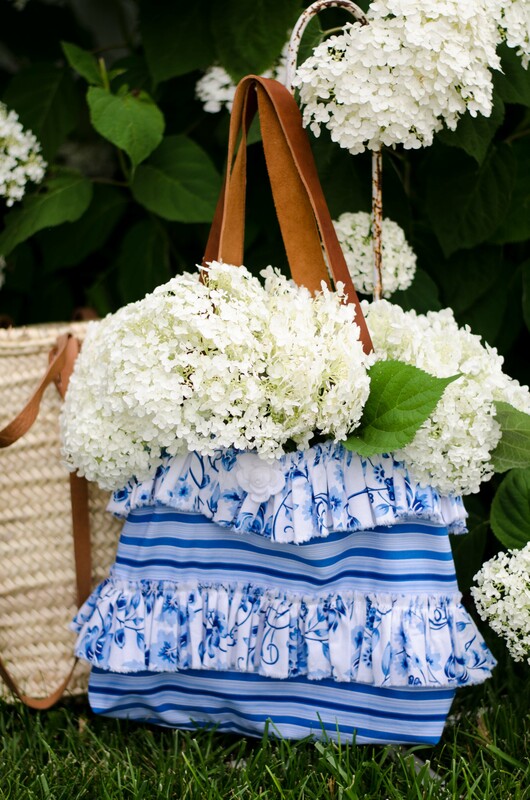 Handbag is a perfect size to use as a flower gatherer. 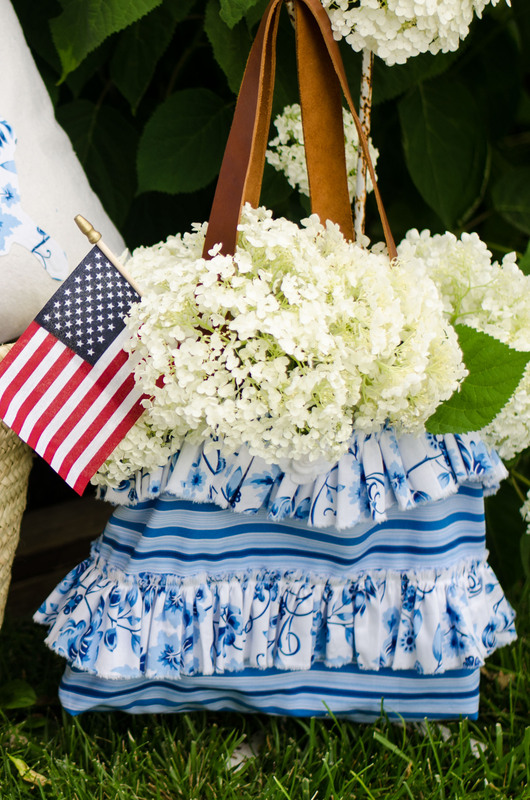 Let’s take a peek at the details of the handbag. See where the rick-rack showed up?! 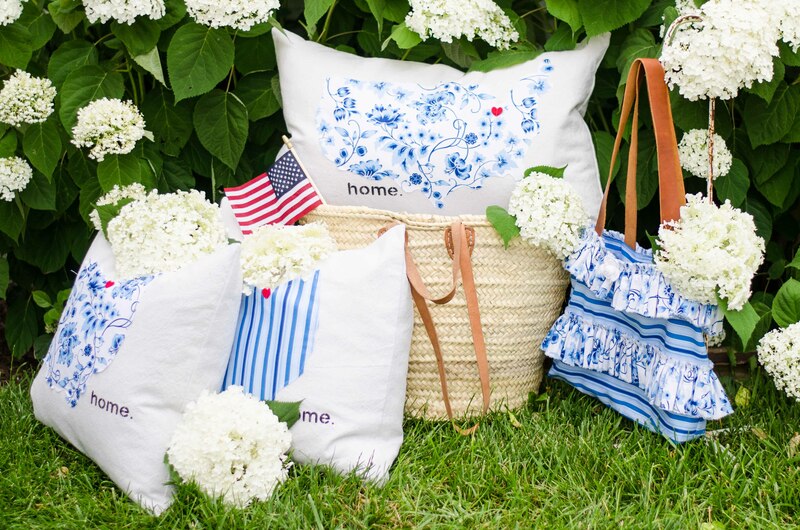 It adorns the pocket on the inside of the bag – just waiting to make you smile when you reach inside for your keys. A white felt flower made by my friend Marcy added the finishing touch to the outside of the bag. I can’t decide if I want to keep this bag or add it to the pile for my next pop-up shop! Now. 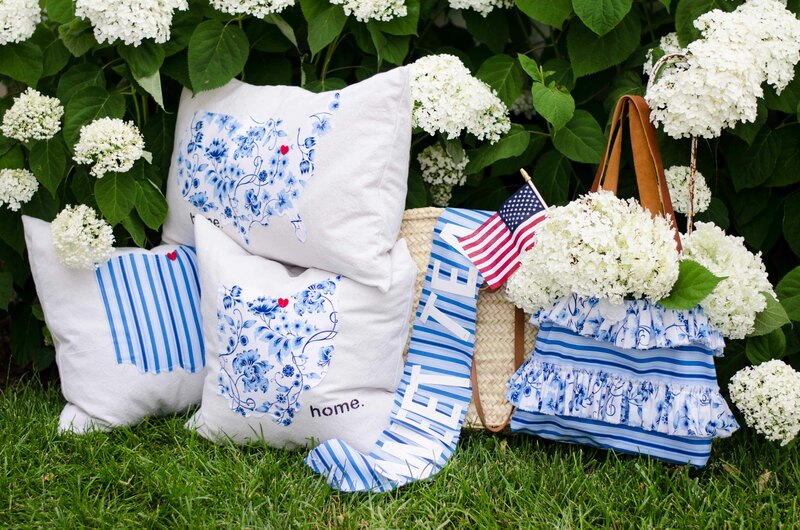 Let’s chat a bit about Hoffman Fabrics. Hoffman has been a fav of mine for years. Back in the late 80’s/early 90’s cotton prints were all the rage for making clothing. And Hoffman was the King of the cotton prints. At least in my world! If someone had a delightful cotton print, it was a safe guess that it was a Hoffman. I remember asking friends if their dress was a Hoffman print. 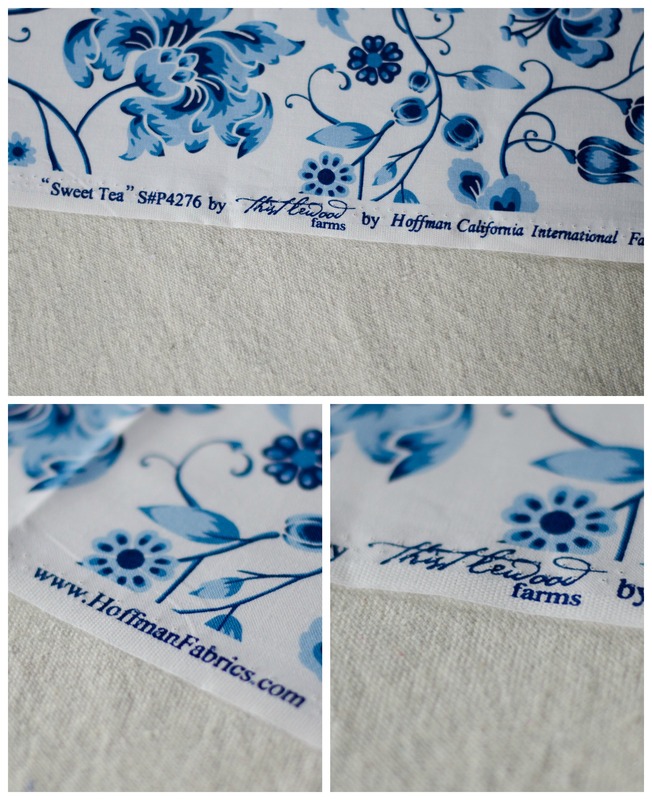 The Hoffman prints were more expensive – but they lasted better, they were more comfortable, and they were a dream to sew! 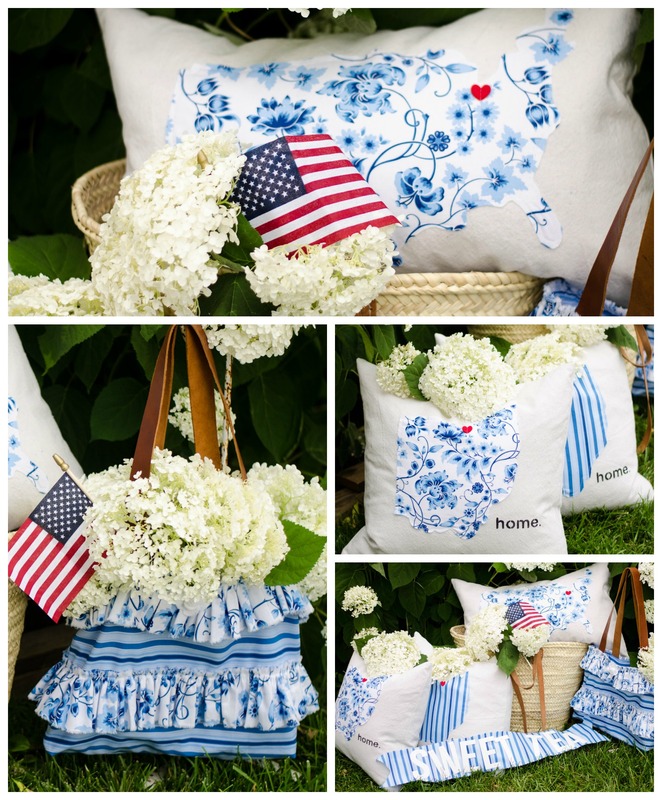 We had a favorite shop a few hours away in Indiana that we would travel to, shopping for fun fabric, and they had the best array of Hoffman cottons! As I got older the trend shifted to fabric types that didn’t wrinkle, and I gradually quit making clothing out of all cotton. These days my clothing trends towards jeans and a t-shirt! That’s when I’m working though – I have a closet full of fun clothes – I just don’t really want paint and fabric scraps all over them! 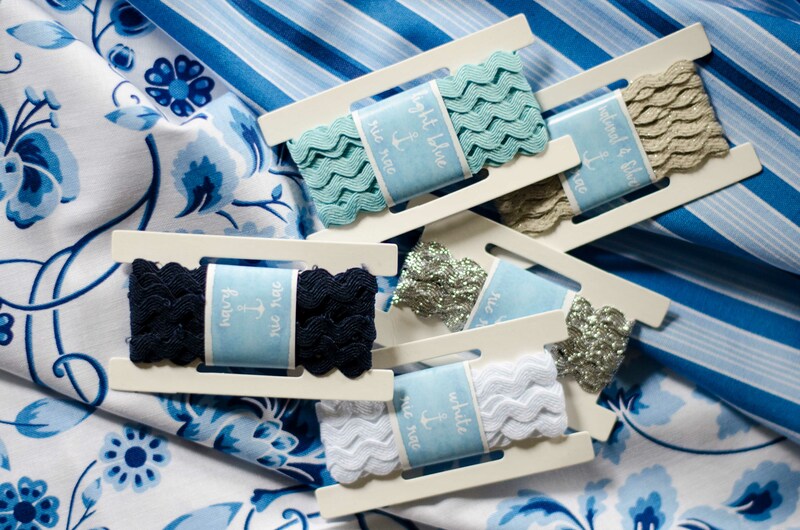 But for my crafting, creating, and designing I still love quality, dreamy cottons. And with Hoffman as the producer and KariAnne as the designer you get it all! When KariAnne said she was looking for ambassadors for this fabric line I almost didn’t apply, but then I thought ‘there is no way to be picked if I don’t apply’! So I did and she picked me, along with 2 other bloggers. Check out Jen and Allison to see what they created using Sweet Tea fabric! And prepare to be amazed – these gals are TaLeNtEd! The good ole US of A. With a heart on Ohio. Or maybe it’s on Kentucky 🙂 Just for you KariAnne! And there you have it peeps! 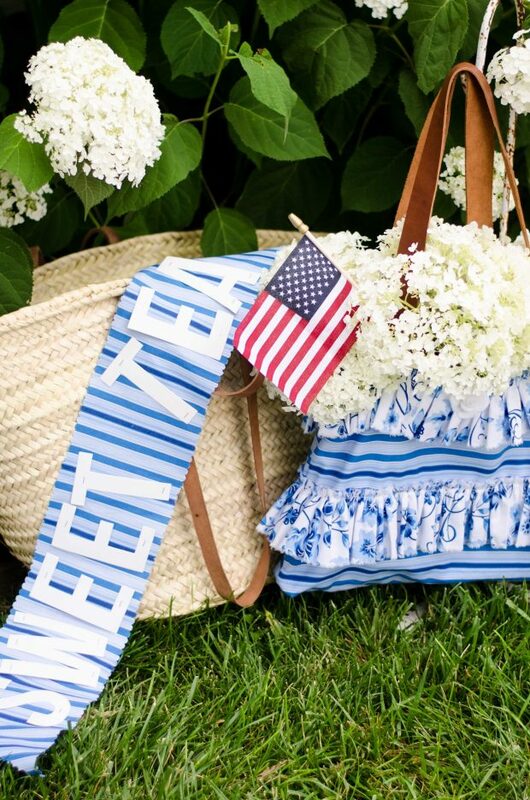 The first installment of Sweet Tea! Come back for more next month! I love it all! You should give your sister the bag. Totally. Because she has no bags. It is very, very sad. Sniff. I thought when you started talking Hoffman, that I remembered that name from the misty past. How super fun!! I really, really, really like what you did with the rick-rack. Really. It’s the details!